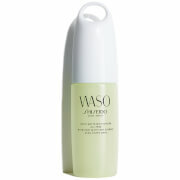 WASO SHISEIDO Quick Matte Moisturizer Oil-Free 75ml, an oil-free and oil-balancing, hydrating and mattifying facial gel. Suitable for all skin types, oily skin in particular, the moisturising gel emulsion is designed to reduce shine and immediately balance the skin with 24-hour hydration. The innovative formula uses PhytoResist System+, a blend of complex botanicals, with Loquat Leaf Extract, Glycylglycine and sebum absorbing powder to regulate sebum production and minimise the appearance of pores. Peony Root Extract works to prevent the appearance of imperfections, and Yuzu Seed Extract infuses skin with moisture for long-lasting radiant results. Active Ingredients: PhytoResist System+, Loquat Leaf Extract, Glycylglycine, Peony Root Extract, Yuzu Seed Extract. Skin Type: All Skin Types, Oily Skin. Treatment Type: Mattifying Oil-Free Facial Moisturiser. Shiseido Waso Quick Matte Moisturizer Oil-Free 75ml / 2.5 fl.oz. WASO SHISEIDO Quick Matte Moisturizer Oil-Free 75ml was found on 5 websites and was price compared using EAN: 0768614139607. The cheapest WASO SHISEIDO Quick Matte Moisturizer Oil-Free 75ml is shown as the main item, prices range from £27.95 to £35.00, excluding delivery. Price comparison based on price and delivery charges, with any valid discount codes being applied, is shown in the table above. Prices and information correct at the time of publication.